APPROACHING the end of the Losail circuit’s start-finish straight, the 1290 Super Duke R is close to its top speed of about 160mph – and I’m struggling to pick out the green flash of fake trackside grass that is my braking marker, because my head is almost being ripped off my shoulders by the wind. 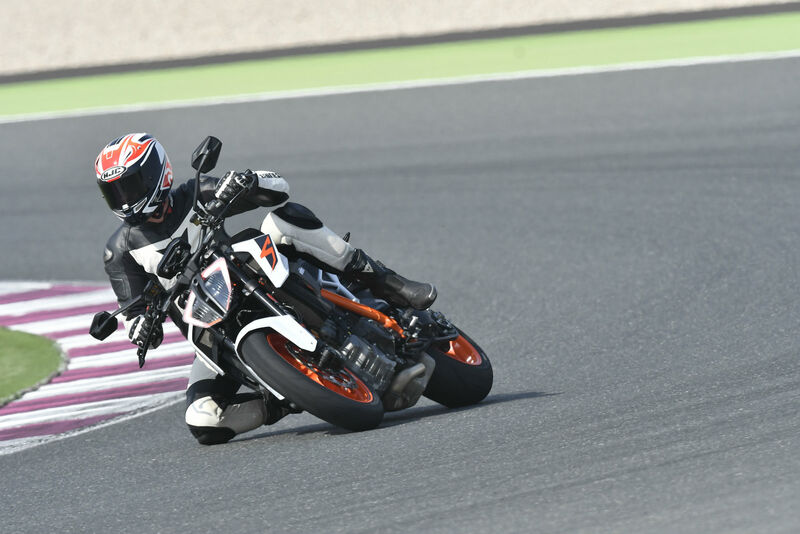 This is the penultimate lap of the third session at the MotoGP track in the Qatari desert, and if my neck muscles are starting to show the strain in the breeze and heat, KTM’s revamped super-naked bruiser is showing no sign of doing the same. The 1301cc V-twin engine is still punching it out of bends as hard as ever, and the bike is still lapping enjoyable rapidly and with a very high safety margin thanks to its revamped chassis and electronics. We’re here for afternoon and evening sessions at the track, after a relatively short road ride yesterday, because KTM has used the 1290 Super Duke GT’s recent introduction to shift the R model subtly in a sporting direction. That means Beast 2.0 is even more beastly, gaining 4bhp to a maximum of 174bhp, and also gets firmed-up suspension along with its knife-sharp new styling and a bunch of electronic refinements. The 75° V-twin gets titanium inlet valves, higher compression ratio and shorter inlet funnels, which allow it to rev 500rpm higher, producing the extra power. It also gets resonance chambers alongside the cylinder heads, which are claimed to smooth low-rev response and reduce CO2 output by ten per cent. A new stainless steel exhaust helps get through Euro 4. There’s no change to the tubular steel frame or aluminium single-sided swing-arm, but the WP forks get stiffer springs, and the shock is tweaked with stiffer preload and damping settings. The one-piece handlebar is shifted forward and down slightly, and is also 20mm wider than its predecessor. Brakes remain Brembo’s M50 calipers and are now plumbed with cornering ABS, via a Bosch IMU similar to that in the Super Duke GT. Most visible electronic updates are the striking, low-mounted LED headlight and new colourful TFT display. There’s also a bunch of new features: keyless ignition, cruise control and tyre pressure monitor as standard; two-way quick-shifter and an additional Track engine mode as accessories. The latter comes with a £283 Track Pack that adds three-way adjustable throttle response, nine-way adjustable slip control for the traction control (adjustable on the fly) and launch control. The latter’s value was confirmed by a couple of drag races on the Losail pit straight, in which the launch-contolled bike’s wheelie-free getaway was quick but didn’t feel it. 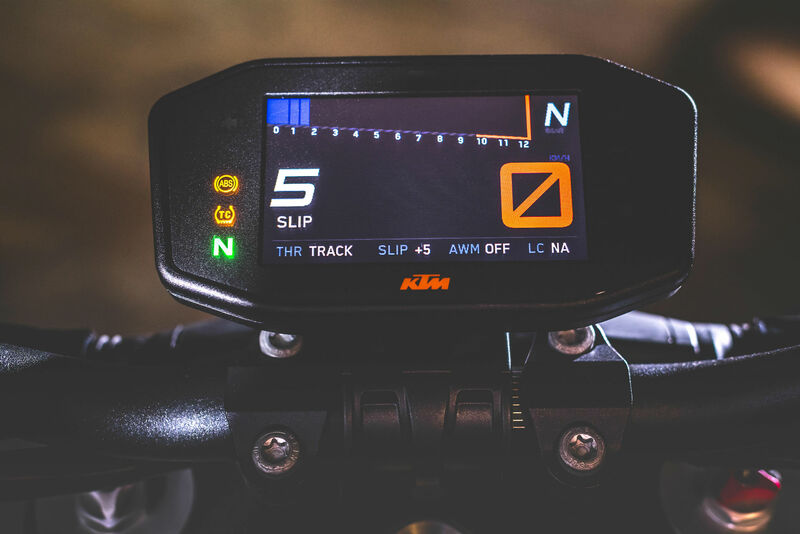 Track mode also allows the anti-wheelie to be turned off without disabling the traction control, which some riders will be unimpressed to learn can’t be done as standard. Such was the Qatari police’s reputation that for once nobody had much enthusiasm for wheelies on the short launch ride round Doha, where the KTM’s wonderfully grunty engine and excellent throttle response nevertheless helped make the bike great fun for tonking out of roundabouts. Even here I was glad of the quick-shifter, which coped well with the low-rev changes than can cause problems. The chassis impressed too. The more aggressive riding position didn’t seem uncomfortable, partly because the wide bar is still fairly high, and partly because the firmer suspension still has plenty of travel and compliance. 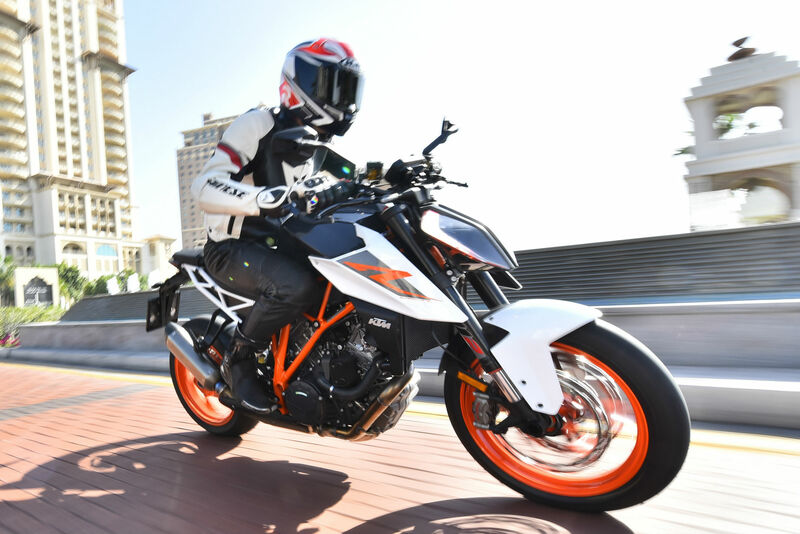 With 125mm up front and a near adventure bike style 156mm at the rear, the Super Duke had plenty in hand for gliding over occasional Doha drain covers. All that travel wasn’t quite so welcome next day at the track, even though WP’s man had firmed up all the bikes from the new showroom settings. The bike was fun to ride in my first session, and some light riders found it fine. But my oversized carcass compressed the shock under acceleration, leading to the bike running wide out of turns and getting a weave on down the straight. Adding a bit more preload and damping was a big help, making the bike steer much more accurately, corner with notably more precision and thunder onto the pit straight with barely a waggle of its bars. We also got a few laps on an R-bike fully kitted out with Performance Parts including titanium Akrapovic Evo exhaust, Dunlop slicks and most usefully stiffer WP race suspension, which felt notably sharper as well as thrillingly quick. Most large riders would probably benefit from a firmer shock spring for track use, but the standard one is fine on the road and has heaps of damping adjustment. The wide bars help you chuck the bike around, and a squeeze of those M50 calipers had it slowing mighty hard too, benefitting from the impressive grip of Metzeler’s Racetec K3 rubber. And that fantastic grunty engine was every bit as impressive on the track as it had been on the street. It churned out dollops of easily controllable grunt from 5000rpm when requested, with a useful choice of immediacy in Track mode. It stayed smooth to the redline at 10,500rpm, and generated power and speed so effectively that half-way down the pit straight I occasionally tried to hook a non-existent seventh gear. So perhaps it’s not surprising that by the time KTM’s super-naked contender approached my braking marker, several seconds later, it was making life distinctly uncomfortable. 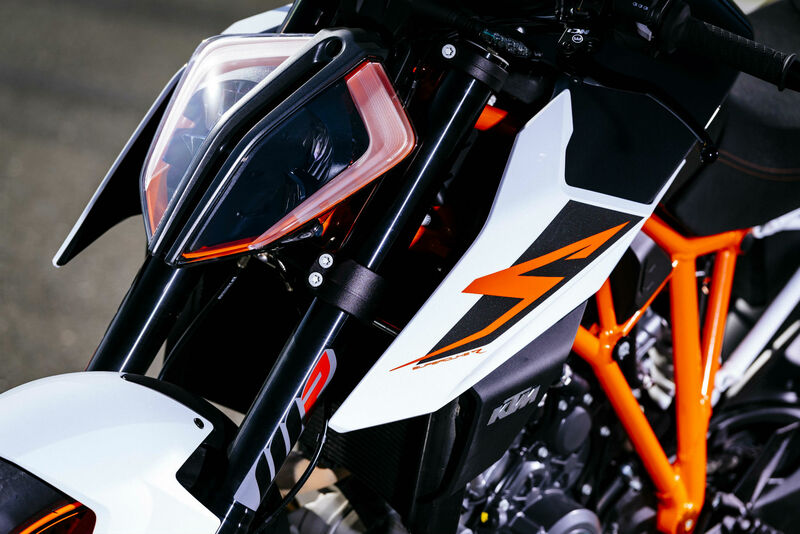 The Super Duke R is more refined and composed than its predecessor. Better still, at £13,999 it’s also no more expensive. But perhaps the Beast 2.0’s most appealing attribute is its enthusiasm for tearing your head from your shoulders. Suspension: WP upside down fork with separate damping controls, rebound on the right and compression on the left. Shock adjustable for preload, plus rebound and low- and high-speed compression damping. Brakes: Radial four-pot Brembo Monobloc calipers on 320mm twin floating front discs; twin-pot Brembo caliper on 240mm rear disc. Cornering ABS.